Learning to Fly: Cross Country Solo - Finally! Cross Country Solo - Finally! After getting back from my week-long vacation on Saturday, Chris's schedule and the weather haven't played along. Finally last night things came together, and I made my solo cross-country flight to Groton. I got to the airport just minutes after 6 and was all signed-off and behind the yoke by 6:30. During the preflight I noticed some water got in with the fuel, but I managed to drain it all out and have Chris confirm I was clear to fly. I was. My instructions were simple: fly to Groton, then fly back. If I felt uncomfortable with the landing, do a missed-landing (which is generally the same as a go-around, though a go-around implies you'll try landing again). I could do some touch-and-gos there, just land and taxi back for another take-off -- whatever I wanted. Chris said he wouldn't be there when I got back, but to call him and let him know I got back safe. Walking away he wished me good luck, and issued a final - less than reassuring - command: "don't die." The taxi, run-up and take-off all went fine. I kept my flight plan to Groton, my sectional, and my baseball cap (to block the sun from my eyes) on the empty seat next to me, along with the return trip flight plan tucked away. I'm a very visual person, and I've been visualizing this flight ever since Chris and I first made it together, so while I did locate every checkpoint on my flight plan, I forgot the first one (Waterbury) until it was behind my left shoulder. I knew where I was going, and could probably make the flight without checkpoints, but to keep the practice up I used them. Past Waterbury though I was getting nervous when I hadn't seen Meriden Aiport (MMK) yet. I had been drifting a little further south than I wanted since the heading indicator kept sticking, but the airport should still be in sight. Finally I came upon it -- I was expecting it to be closer to the ridge I flew over already, but it was further east than I remembered. I confirmed my mistake on the sectional and now I probably won't make that one again. On the way there the sky was clear, the winds were calm and I had little-to-no work that I really needed to do. I was flying GREAT! Looking out the window - scanning for traffic - check the ground for emergency landings and reference points - glance at the instruments to make sure everything was OK - back to looking outside, repeat. After a little while I started noticing some faint sounds in my headset -- it certainly wasn't air traffic. I listened closer and realized it was definitely a radio station, as in AM or FM radio. I couldn't tell exactly what was being said or played, but once I realized my radios seemed to still work, I was just amused by it. Strangely, it stayed in my headset even when I changed to other frequencies. I just shrugged it off -- at first. As I got Groton in sight I had been checking their ATIS to make sure I knew what to expect when I got there. They were using runway 23, which was the same one Chris and I used when we made the flight together. I had mixed feelings about that: I'm familiar with that approach and landing which is a plus, but coming from Oxford I'm set up perfectly for a straight-in landing on runway 15. Well, I certainly wasn't going to ask the tower for special permission, so runway 23 it was. 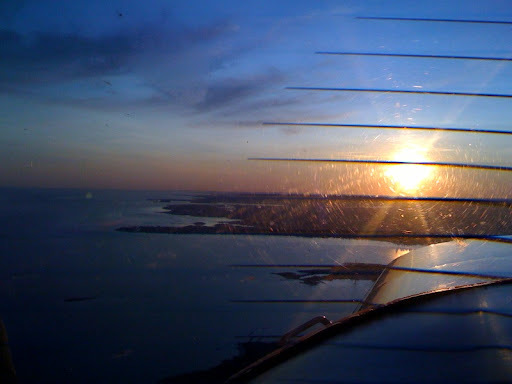 During my flight to Groton I had used the "digital VOR" that I've mentioned in a few previous posts to get my heading and distance to Groton, so I knew when to call and inform them I was close to entering their airspace. I realized after I could have used the checkpoints on the ground instead, since I had measured those distances previously, but I liked having multiple systems to double-check. 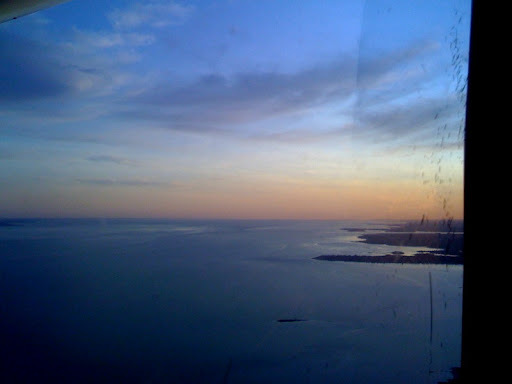 As I got closer and closer to Groton I wanted to call the tower and run-off all the information I wanted to give them: "Groton Tower, Cesnna 48984 12 to the West-Northwest, solo student requesting landing, taxi-back, with Delta." I made the call, but I knew I was a little more than 12 miles out, despite my report. This was when things got interesting. Although Groton Tower heard my request, they called me back informing me that my radios were fuzzy and asked if I had another I could use. Not sure what to do, I simply called back, speaking louder and more clearly, asking "984, is this better?" "984, not really, you're still pretty scratchy, but I can make you out. Report 3 mile right base." "984, will report 3 mile right base, thank you." As I was getting closer and lower to the airport, suddenly my radios freaked out. It sounded like the channels on a TV that are only static, with no one talking. As I was getting close to my 3 mile mark I considered calling the tower and asking if they heard it to -- or if they could hear me at all. I worried that my radios had died completely and that I was going to either be making a landing by coded lights (something I'd studied a bit, but wasn't a master at, and certainly wasn't prepared for) and wondered if I should turn my transponder to 7600, the code for "no radios". First, I thought, let me try my call to tower. "984, entering 3 mile left-- err, sorry, right base." "984, clear to land," I confirmed. On the way down I noticed they gave someone else clearance to take off on runway 23 ahead of my landing. I was a little surprised, but I slowed down a little more to make sure he had space. My landing was smooth and I was cleared to taxi back for my take-off. The traffic had really died down and I was the only one currently using the runway, so I was cleared to take off as soon as I'd requested it. "984, I'll call your turn"
"984, could you repeat that?" "Groton Tower, 984, could you repeat the last instruction?" "984, I'll call you when you can make your turn out." "984, waiting for your call, traffic in sight." "984, you're clear to turn after that traffic." I love radios. I don't understand why people are so afraid of them; yeah, you might mess-up on it and sound like an idiot, but they really are wonderful tools. And not being too afraid to ask for that command to be repeated could have saved me big trouble had I not seen the incoming traffic. The rest of my climb to 4500' was smooth, and once I was out of the Groton airspace I called tower requesting a frequency change, and thanked him for his help. Now I was just flying back towards Oxford -- straight into the sunset. Hmm... straight into the sunset. It was beautiful, certainly, but I couldn't see squat. I took some pictures with my phone (which came out funny due to the prop) which I'll get uploaded at some point. UPDATE: Here are the photos, finally! I tried looking for traffic, but it was hindered by the glare. Also, as the sun was going down things were getting darker. That started making me concerned, but I reassured myself that I was very familiar with this flight, and that I had the tools and knowledge to get back, even if it was dead night. The fact that the cold air vent was open and blowing on me just made things less comfortable. 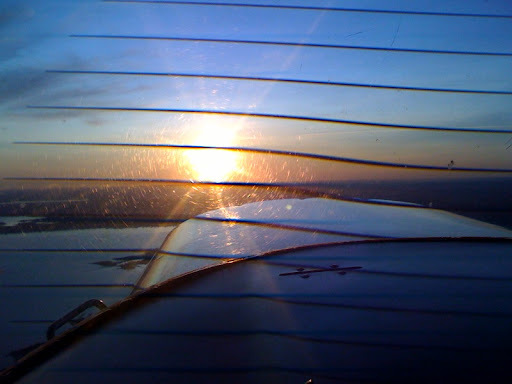 Once I was on my way, and realized I couldn't make the plane go a whole lot faster (in an attempt to beat the sunset), I decided to find my checkpoints and fix the things that were annoying me. First, I put on my baseball cap on under my headset to block the sun better. Second, I grabbed the air vent's plug from the back of the plane and shoved it in. Third, I reattached the visor which had fallen off while I was climbing. Finally, I took off my sunglasses once the sun was behind the mountains, which helped clear things up a bit. As I got closer to Oxford I heard the faint radio music playing. I'm sure it wasn't "A Whole New World" from Alladin, but for some reason I got that song in my head. Appropriate for flying, I guess. I'd had some troubles with the "digital VOR" earlier -- it was giving me two different headings and distances to Oxford -- but now it seemed consistent: I was 12 miles out with a perfect heading. Wait, 12 miles already? Oops! Time to get ATIS! Got it and called Oxford Tower. I was told to report a 3 mile right base (that sounded familiar), but as I got closer I heard the tower talking with another plane who was going for a straight in to the runway. As tower called me to inform me of the plane ("it probably shouldn't be a factor for you, but I'll call it anyway") I got it in sight and informed the tower. They called back "984, clear to land #2 following that traffic." I'd turned on all my lights so it would be easier for the tower to see me, as well as any other traffic. The runway was all lit up, though it wasn't technically a night landing yet. I set up perfectly, and finally figured out giving that little push of left rudder as-needed during my landing at Groton (though at Groton I felt like I swerved on the landing a tiny bit; practice will help). As I attempted my flair, however, the plane refused to level out. I just "sat" on the runway. It bounced slightly, though it wasn't a rough landing. Strange. I'm still not sure why it happened, but I was done for the night, so I didn't worry about it. As I was cleared to taxi back to parking I considered asking the tower if he had any problems with my radios, but decided not to bother him with it. I'd let Chris know when I called him after I tied the plane down. I parked and performed the tie down and logbook entries, then, as I was walking away from the plane, I got a phone call from Chris. I didn't get back until 8 o'clock, so it was an unusually long flight, though Chris's major concern was because they had actually shut down Oxford's runway for 15 minutes due to a plane that landed with its brakes on. Oops! Strangely, it was actually the Extra (a VERY fancy stunt plane) that did the run-up behind me prior to my departure from Oxford. Anyway, he was glad I was back and safe. I told him about the radios and how I picked up some AM or FM station. Apparently there were two things at play: 1. the actual VOR was left on, which caused interference, and 2. the radio's connections needed to be cleaned. Chris is supposed to have that taken care of today so I can perform my long-cross-country (150 miles minimum) tonight. Tonight's flight: OXC-GON-EWB-OXC, all solo. And I've never been to EWB before, so I better get studied up! Assuming things go as planned tonight, I'll be making another post soon. Now THIS one is scary.